Geographical distribution The Indian film industry, famously known as Bollywood, is the largest in the world, and has major film studios in Mumbai (Bombay), Calcutta, Chennai, Bangalore and Hyderabad. Indian Films arrived in less than a year after the Lumieres first exhibited their cinematographie in Paris. An agent who had brought equipment and films from France first showed his moving pictures in Bombay on July 7, 1896 which became an important day in the social and cultural history of the Indian people. In 1913 the first Indian feature film was released and it was 3700 feet long. It was made by Raja Harishchandra made by Dadasaheb Phalke. The film was based on a story from the Mahabharata it was a stirring film concerned with honour, sacrifice and mighty deeds. From then on many "mywhile addressing social differences of caste, class and the relations between the sexes, the "social" films were adopted a modernist outlook which was essential for converging of society. Many directors of the time showed great innovation like The Marathi director, V Shantaram, for example, was alert to world trends in film-making, deploying expressionist effects intelligently in such works as Amrit Manthan. The most important film of the period, Devdas (1935), the director Pramathesh Barua created a startlingly edited climax to a tale of love frustrated by social distinction and masculine ineffectuality. Released in Bengali, Hindi and Tamil, Devdas created an oddly ambivalent hero. Calcutta became the vanguard of the art cinema by the start of the 1950s, with the emergence of the film society movement at the end of the 1940's and Satyajit Ray's Pather Panchali/Song of the Road, produced with West Bengal state government support in 1955. Then in 1951 the Post-independence, despite a relatively sympathetic government enquiry the industry became the moral scrutiny and criticism was subject to severe taxation. A covert consensus emerged between proponents of art cinema and focusing on the imperative to create a "better" cinema. In 1959 The Film and Television Institute of India was established at Pune to develop technical skills for an industry seen to be lacking in this field. Radical cultural organizations loosely associated with the Indian Communist Party organized themselves as the All India Progressive Writers Association and the Indian People's Theatre Association (IPTA) was born. The latter had then produced Dharti ke Lal/Sons of the Soil (KA Abbas; in the year 1943) and its impact on the industry can be seen in the work of radical writers such as Abbas, lyricists such as Sahir Ludhianvi, and directors such as Bimal Roy and Zia Sarhady. In addition, directors like Raj Kapoor, Guru Dutt and Mehboob Khan created films that reflected a passionate concern for questions of social justice. In this era there were largely studio-based, the films nevertheless incorporated with vivid stylistic experimentation, influenced by international currents in film-making. Such effects are evident in Awara/The Vagabond (Raj Kapoor, 1951, script by KA Abbas), Awaaz/The Call (Zia Sarhady; 1956) and Pyaasa/Craving (Guru Dutt; 1957). In 1951 The First International Film Festival was held which showed Italian works for the first time in India. The influence of Neorealism could be evident in films such as Do Bigha Zamin/Two Measures of Land (Bimal Roy, 1953), a portrait of father and son eking out a living in Calcutta that strongly echoes the narrative of Vittorio de Sica's Bicycle Thief (1948). In 1949 Mehboob Khan's Andaz/Style, an upperclass love triangle founded on a tragic misunderstanding, draws on codes of psychological representation. India's emergent art cinema, led by the Bengali directors Ray, Mrinal Sen and Ritwik Ghatak reacted against such spectacle.In later work of Ray on urban middle-class existence, Mahanagar/Big City (1963), Charulata (1964), Seemabadha/Company Limited (1971), Pratidwandi/The Protagonist (1970), and Jana Aranya/The Middleman (1975), his rational, humanist vision is at the same time at home in the city, and repulsed by it; overarching estrangement is relayed through images of futile job interviews, cynical corporate schemes, murky deals in respectable cafes. During the 1960's, popular cinema had shifted its social concerns towards more romantic genres, showcasing such new stars as Shammi Kapoor and later, Rajesh Khanna, a soft, romantic hero. The period is also notable for a more assertive Indian nationalism and following the Indo-Pakistan wars of 1962 and 1965, the Indian officer came to be a rallying point for the national imagination in films such as Sangam/Meeting of Hearts (Raj Kapoor, 1964) and Aradhana/Adoration (Shakti Samanta; 1969). However, the political and economic upheaval of the following decade was accepted turning point in the popular film was the angry, violent Zanjeer/The Chain (Prakash Mehra; 1973), which fed into the anxieties and frustrations generated by the quickening but lopsided pace of industrialization and urbanization. Establishing Amitabh Bachchan as the biggest star of the next decade. In Zanjeer, the casual killing of a witness on Bombay's commuter trains conjures up the perils of life in the metropolis. The Art Cinema of the 80's diversified from its Bengali moorings of the earlier period under the aegis of the Film Finance Corporation. Works by Shyam Benegal, Gautam Ghose, Saeed Mirza, BV Karanth, Girish Kasaravaili, Mrinal Sen, MS Sathyu, Ray, and Kundan Shah, among others, actively addressed questions of social injustice: problems of landlord exploitation, bonded labour, untouchability, urban power, corruption and criminal extortion, the oppression of women, and political manipulation. The most notable of the directors, who speak specifically about their own cultures, and about the possibilities of change, are Adoor Gopalakrishnan and Aravindan from Kerala. The key to the productivity of South Indian Industry was the overall development of film culture in Kerala. In the 1990's the Telugu and Tamil industries, and directors such as Ram Gopal Varma and Mani Ratnam, are at the forefront of such moves, showing a lively interest in new techniques. Varma's Shiva (1990) and Raat/Night (1991) showcase the use of steadicam - in the latter, to the exclusion of any serious narrative. In 1993, Ratnam made an important breakthrough with Roja. The total size in the year 2009 was Rs 6,800 crore and projected size by the year end of 2010: Rs 15,300 crore and growing with CAGR I.e. the compound annual growth rate of 18% . India has the unique distinguishing producing capacity the largest number of films anywhere in the world and in many languages. India produces about more than 1000 feature films and 900 short films every year. With rough estimations, a total of about 15 million people see films in India everyday, either in its over 13,000 cinema houses, or on Video and Cable. In the year 2008-09 the Indian film Industry contributed $6.2 billion to India's GDP while employing 1.8 million people according to a study prepared by PricewaterhouseCoopers. According to the analysts the film industry contributed $1.5 billion to the Indian economy, which includes the $67 million contribution of the American and international film industry. The total gross output, which includes total revenue from various streams such as theatrical home video, etc of the US and foreign film industry in India is estimated at $180 million.The revenues of the Indian film industry were over $7.7 billion in 2008 and the report predicts that it is expected to grow 11% over the next five years, reaching a size of over $13 billion by 2013. Indian Film Industry is just not restricted to fun and entertainment and earning profits but is also one of the biggest employment generating industries of the Indian economy. Today the growth of this industry is quite phenomenal with the changing preferences of movie-goers and filmmakers. The Indian Film Industry is estimated to have grown at a CAGR of 5 % over the past 3 years. 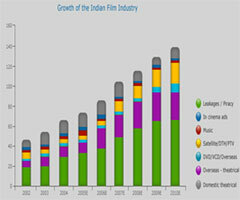 The Indian Film Industry has earned revenues of around Rs 89 billion in size in 2009 and growth of 14 % over 2008. Indian film industry is now increasingly getting professional as lot of production houses such as Yash Raj Productions, Dharma Productions, Mukta Arts etc. are now working on corporate lines. According to FICCI-KMG 2010 over the next 5 years, the Indian film industry is projected to grow at the CAGR of 9% and reach the size of Rs 137 billion by 2014.